Home / Search by Media Type / CD / D-GRADE: D-structive D-Vice CD. Killer Thrash/Groove Metal. ULTRA rare odd shaped (Circular saw!) CD. MUST HAVE. 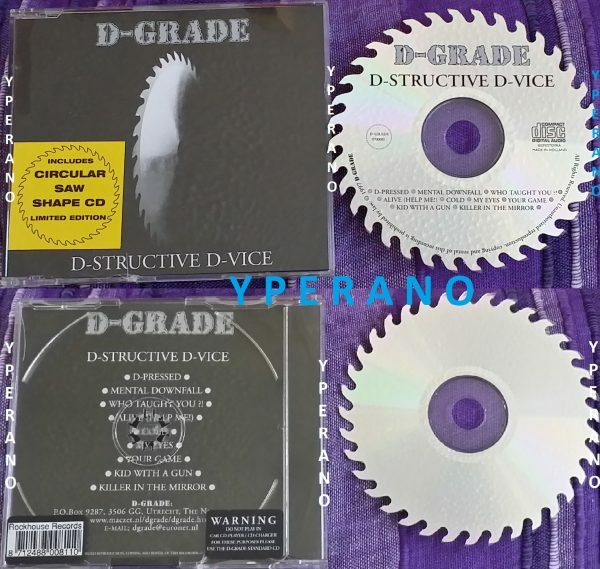 D-GRADE: D-structive D-Vice CD. Killer Thrash/Groove Metal. ULTRA rare odd shaped (Circular saw!) CD. MUST HAVE. D-Grade from Utrecht, Netherlands with their rare and O.O.P. shape CD that released in 1997…Dolf Blomhert that played in some cool other bands like Spartacus, Exploder, Warchitect, Silence End is here also…Great Riffs, Aggressive Parts, Groovy Breaks and an excellent production for a self released CD…Enjoy 1 of THE best Thrash/Groove albums of the mid-90s.